The guys chowed down Hawaiian style. These guys can eat and put us all to shame. But when it was all said and done, they were packed! Some good meat, se good sushi! Today we are eating at the "all you can eat" Korean style BBQ. Pastor Rick from CCO is treating all the Bible College students for serving this past semester at his church. Thanks again bro, the students are blessed! Like we always say "You have not been to Okinawa unless you have been to the Pineapple Park". The crew experienced it Okinawan Style. Okinawa used to be the Pineapple capital of the world before Dole took over in Hawaii. Then our sugar cane industry took off. The team traveled up to Nago today and visited with Pastor Tim and his family. It was about a two hour drive up North. Plus it was raining, so the drive was not as beautiful as it normally is. But they still had a blast! 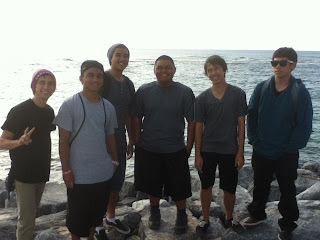 The Hawaii team was apart of the youth service during second service. A few of the guys were able to share this morning. Afterwards they fellowshipped and spent some time together. Thanks guys for the blessings. The Hawaii boyz were at Okinawa International University today passing out fliers inviting them to be a part of the Bible Study that Tatsuhiko teaches there on campus. It was a great way to share with the Japanese students here on island. Great job team! It was a blessing having Tomoko with us the last few days. Too bad she had to get home so fast. It would have been fun just to hang out and chill. Be safe girl, God bless you! Dean Pera is looking sweeto in his new glasses. He looks professional! 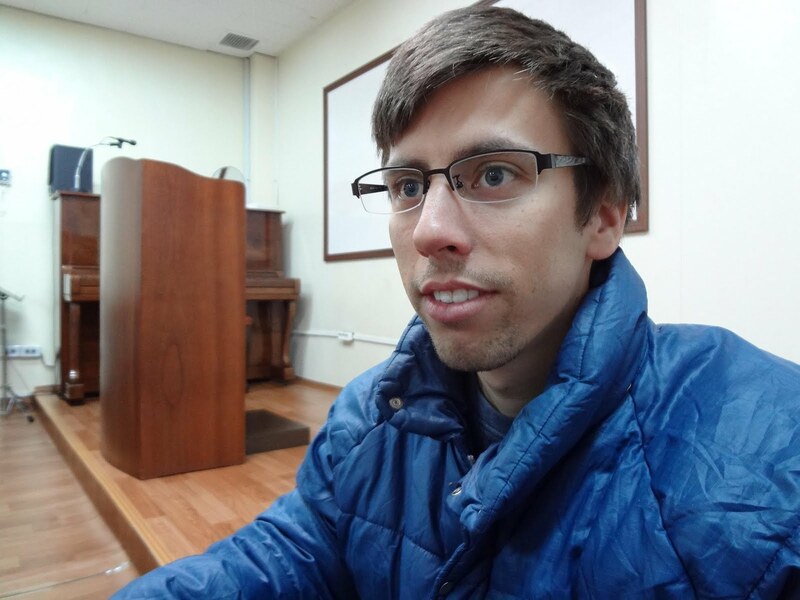 Please continue to pray for Dean as he serves the Lord in Cheonan Korea. God bless you bro, it was so good hanging out with you in Daejeon. God bless you bro! Chillin near the rocks. The ocean surrounds us so why not check it out. The guys are looking at the South China Sea. If they turned around and started swimming they they would end up in China. Good picture guys. Every year the girls vs. the guys for the wishbone championship. Wednesday night it was 1-1. The girls' have never lost. Tonight will be the championship; Who do you think won? Samuel could not handle; he was too tired and gave into sleep. Maybe it was the turkey, who knows. Sleep good bro, you will be wide awake at 2am. In honor of the Hawaii students we moved our celebration to Friday evening. They were in mid flight Thanksgiving day so they did not miss out! We are grubbin down. 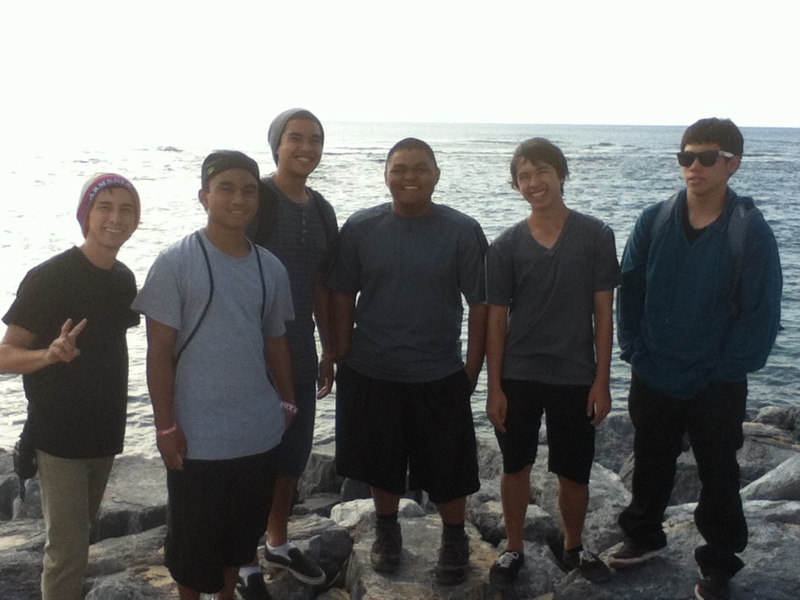 The guys from Hawaii arrived safely and they hit the ground running. They began the morning by sharing their hearts with us in devotions. Then it was off to Kakazu Ridge for some Okinawan WWII war history. After lunch (Joel famous fried rice) they went to Mihama to shop and exchange money. Next stop; Thanksgiving Dinner, then out witnessing. Whew! They are going to sleep good tonight. Pretty awesome, this is the first time that she has just translated on the fly. Her English skills are growing rapidly, so blessed as she continues to grow in Jesus. So many sweets! Sugar heaven, Japanese style, black coffee and desserts, the only way to go! In the words of Joel Coronado "too much!" We are so glad that we had the celebration downstairs instead of upstairs. There were so many people and everyone is so full! Pastor Tim gave a great Thanksgiving devotion. So many Japanese people. Korea was a super blast! But it is sure good to be back in the warm weather of Okinawa. We were in pants and jackets in Daejeon but here on island we are wearing t-shirts, shorts, and flip flops, whooooeeeee! It is good to be home! This is part of our Filipino family in Korea. They are from Iloilo and they are studying in Korea. They were such a blessing to be around with. Like I tell everyone, the best thing about the Philippines is the Filipino people. It was a bummer leaving them, just when we were getting to know one another. God bless you gang, we love you. We had such a wonderful time in Daejeon. Pastor Mike and Cobb are great brothers. 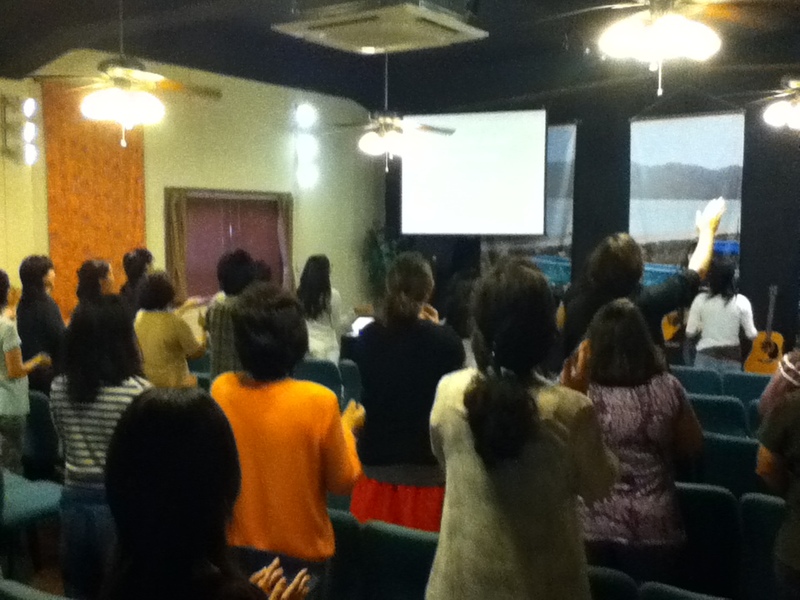 The team had such a blessed time ministering to the Korean Brothers and sisters. Pastor Victor showed up and blessed us with a special prayer. It was great seeing him. Next stop; Fukuoka. Ministry at "School of Tomorrow"
Daniel teaches at SOT. He has been there for almost a year. It was a blessing to share Jesus with all the kids. Good job Daniel! Hi everyone! 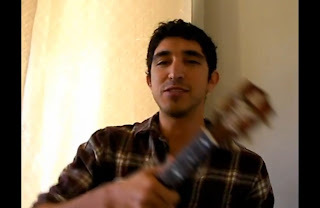 Here is a recent photo of our brother Juan-Diego; He has recently been accepted to the land "down under", Australia. He will be heading out for a missions trip to serve along side YWAM for a few months. Please keep this special brother in prayer. Isn't it so exciting to see so many people taking steps of faith for the Lord. God bless you bro! Be blessed, and you will be in our prayers. This is a Christian Coffee House in Daejeon and it rocks the house. It is so beautiful, it puts Starbucks to shame. People come and just chill out. Sam is loving it. 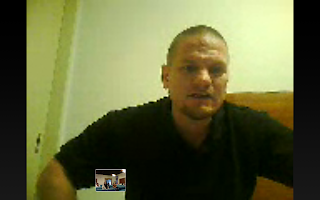 This is Bradley our good brother from down under! We spent a lot of time with him talking about Australia and how he came to know Jesus Christ! Go is doing a good work in his life. Today in Korea all of the Christian Churches celebrate Thanksgiving. So we gathered at CCDaejeon to have a fun get together with the church. There was thanksgiving fixin's for everyone. The blessings of Costco gave us some fat apple pies and pumpkin pie, out of this world. Thank you CCD and thank you Jesus! On Sunday morning, Pastor Cobb, Taliya, Nichole and I headed to the Cheonan church to lead worship and serve at the church. Taliya did a great Jon of leading worship. It was a blessed time. After a busy day everyone gets online. We are all at Dunkin Donuts checking our email and getting caught up with life. The only thing is that we are not talking to each other. Hurry up, it's time to go home and get to bed. Tomorrow will be a super busy day. House of Hope Servants of the Lord! This is pretty amazing! At the "House of Hope" they are harvesting daikon (it is called something else in Korean). They dug this huge hole, then they put the rice stalk on the bottom, then they fill up the hole with the daikon and cover it up with more straw and then cover it back up with dirt. Because the temperature will drop below freezing, this becomes an outside refrigerator for the rest of the season. 12 inches below the earth does not freeze so the daikon will be kept fridge cold. This is amazing! We chopped off the tops of the daikon, then hung the stalks to dry in the greenhouse, and hand loaded the daikon into the hole. We are real Korean farmers. At the "House of Hope" the people gathered as we had a time of worship before we went outside to do some work. The students did a great job of showing the Love of the Lord! We went to the "House of Hope" the physically and mentally challenged Christian home in Daejeon. We did a lot of work and here Daniel is carrying the Kimchi Cabbage. Ahhhhh heaven sent! Another must stop when you are in Daejeon; waffle ice cream and they are super cheap, less than 1 dollar. All of the students loved them. Even Dean got into the munch down. After the English Outreach some of the students from the outreach came back to the church with us for some fun fellowship. It was good to just hang out. This is what Pastor Mike wants; friendship evangelism. 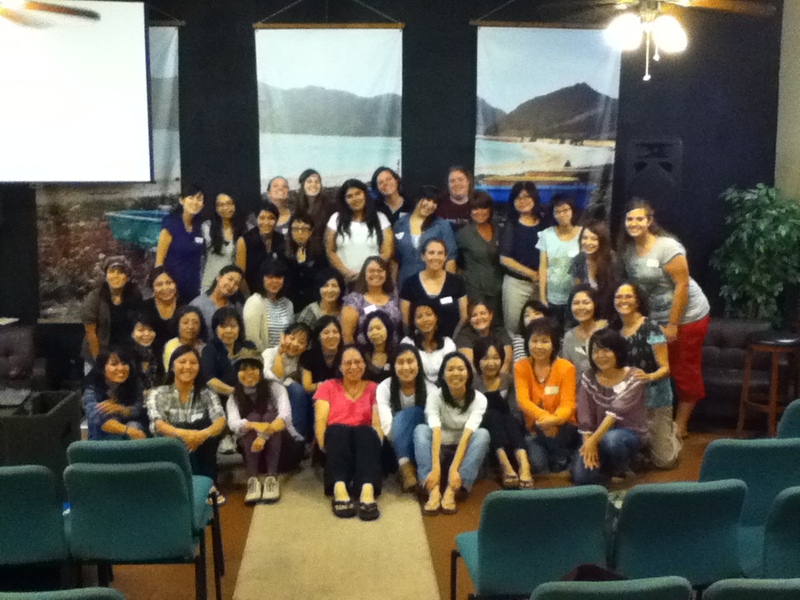 The Okinawan Students hosted an English outreach with Pastor Mike here in Korea. We thought that only 15 students would come but 26 showed up. It was a great time. The students did an excellent job. This guy is a handsome dude, he is looking great! Moses has been so busy. He is attending CCBC online full time classes as well as holding down the fort at church in Seoul. He stated that he is so busy! God is using this Man of God! If you know Taliya she "bats cleanup". Which means that she eats slow and finishes up for us. The food was too delicious to pass up and leave behind. For anyone who has been on one of our missions trips to Korea, you know that we are going to take you to "People making Toast". It is a delicious egg sandwich! Also they make delicious fruit smoothies like old time (Orange Julius). "Sam and the Sammyetes" looks like a good band CD cover. The Bible College students today were so blessed to hear from a Great Pastor. Pastor Santo spoke at the Lectures in Ministry class at CCBC Okinawa. Santo has been a Calvary Pastor for many years now and brings a wealth of information to the students. As God continues to do a good work in the Tokyo area, we look forward to what He will do next through men like Pastor Santo. Thank you brother for taking the time to bless our students. Like clockwork, Pastor Mike picked us up ontime! He brought with him a new friend, Pastor Cobb who serves also in Daejeon. Let the blessings begin! The students are excited to fly on Korean Air. The Video screens were huge. Next stop, the country of Korea! She got up early and made lunch for the students. They were happy when we arrived in Fukuoka. We were all hungry. You know Taliya, she is excited when it is time to eat. We are heading to Korea today to join Pastor Mike Loudermilk as visit with the other missionaries in South Korea. Please pray with us for a safe and fruitful trip. To God be the glory. It has been a blessing having Tatsuhiko here with in Okinawa. 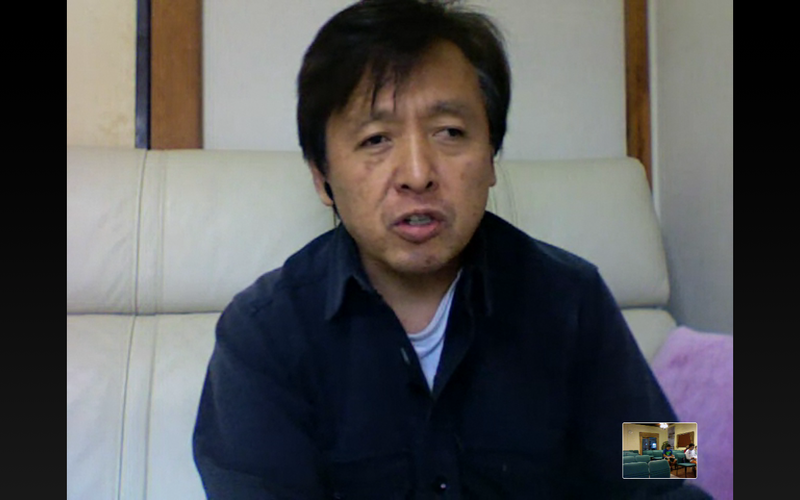 He comes to us via CCWestTokyo with Pastor Santo. Tatsuhiko is a student at Okinawa International University and is majoring in English. He continues to grow leaps and bounds in his relationship with the Lord. It is truly a blessing to have him around. Please pray for us answer will be making our way to Korea this Thursday to go and serve at CCDaejeon. We are looking forward to seeing Pastor Mike, Daniel and his beautiful wife Nayeon and hopefully we will be able to see Dean Pera. Please pray that we will have a fruitful trip. In honor of this special day we went to Drug 11 on 11.11.11 and had an ice cream to honor the day. We will honor any day that gives us an excuse to buy an ice cream. Props and thanks go to the Bible College students for all of their service during the Conference. The gals who are taking Joanna's women in leadership class were in charge of all the preparations, worship and set up for the conference. Thanks ladies for allowing yourself to be used by the Lord, you all were a super blessing! The gals gathered from the different Calvary Chapel's here on the island. It was a real blessing with the different ladies leading in worship and teaching for the sessions and the workshops. The ladies all had a great time, and they said that the teachings were excellent. Praise the Lord! To God be all the Glory! The students were blessed to have Pastor Rich speak to us about ministry in our Lectures class. The video was not the greatest quality but the audio did the trick. It is a blessing to use this technology, since Rich is all the way in Mainland Japan, it is too difficult to fly him in just for the lecture. But we did "fly him in" via the web service. Thank you Pastor Rich for blessing us with your teachings. May God continue to do a great work with you up there in Fuchu. Dan was able to come up and spend some time with us. Before he left we were able to surround him and join together in prayer. We love you Dan! This is a good picture of the group. Everyone had a blessed time. It was good to just hang out and get to know each other. The weather was unusually warm. Most of the time between sessions we laughed, joked around had fun.